I'm working on that Monster Project! I promise! This is not a distractor post! Yesterday, while working a little more on the project, I realized I needed a new way of measuring some of its dimensions. An accurate way, I mean; I'd been using guesstimation up till then. 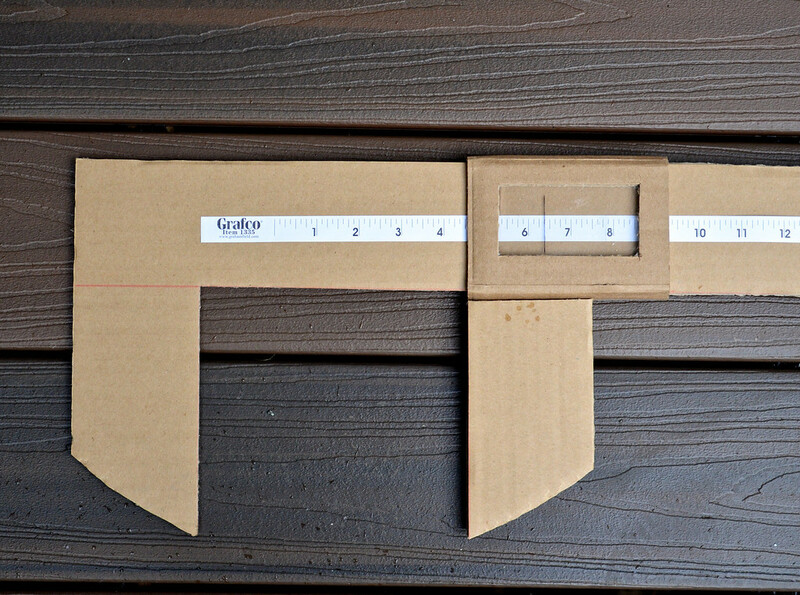 Remembered that when I did Physics at school, we used these things called Vernier callipers. 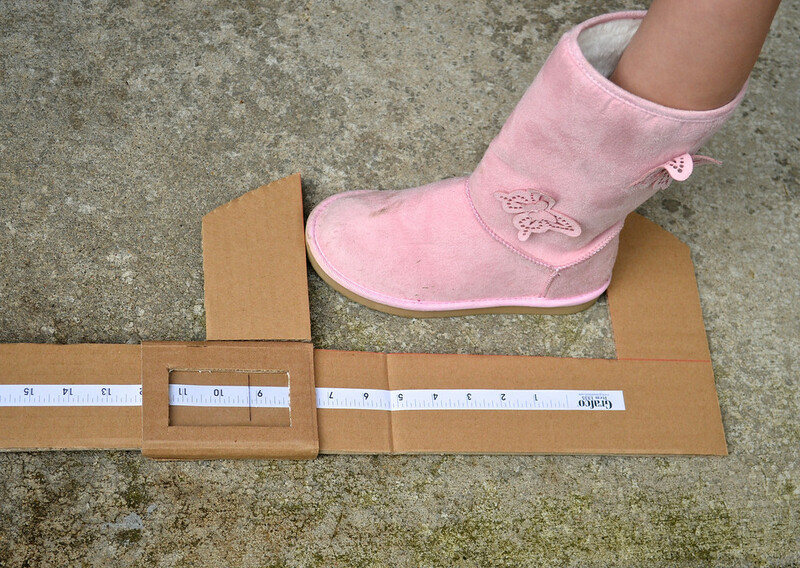 Very useful for measuring outer dimensions of things that wouldn't lay flat against a ruler. Someday I shall add one to my amazon wish list, because it is a very useful tool to have in the house. Also the girls must learn to use one, along with the equally nifty micrometer screw gauge, but let's get back to the point. Super easy. For those unfamiliar with it, it's essentially a pair of sliding jaws (one fixed and one movable) whose distance apart can be measured on a scale. You can probably make your own just by looking at mine. 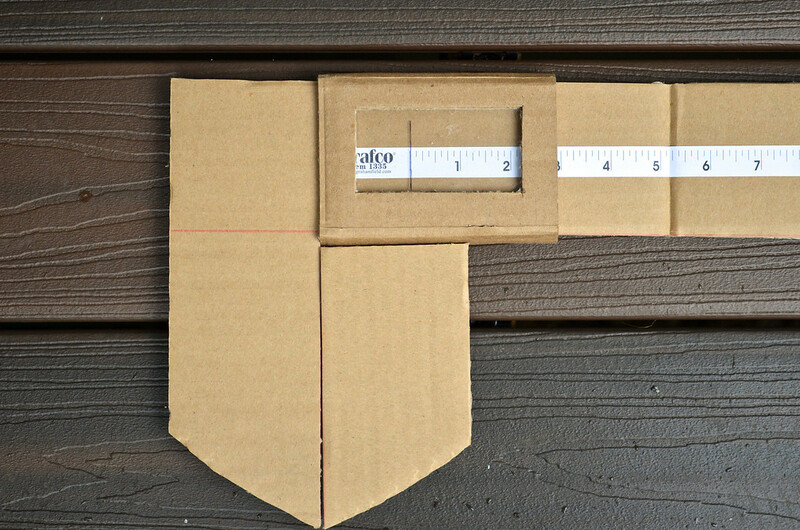 The sliding mechanism is just a sleeve of cardboard with a window. I stuck a piece of plastic behind it so I could draw on my reference line. I used one of those paper measuring tapes they give out at doctor's clinics for measuring head circumferences of babies, but if you don't have a baby to bring in, you can go to Ikea and snag one of their paper measuring tapes. I only had one in the house, or I would have stuck a second one in cm below this one in inches. Anyway, the first thing to do after making your callipers is to callibrate it. This is just a fancy word for "finding the zero position". So close the jaws of the callipers, and draw a vertical line on your plastic window, over the zero mark of the measuring scale. 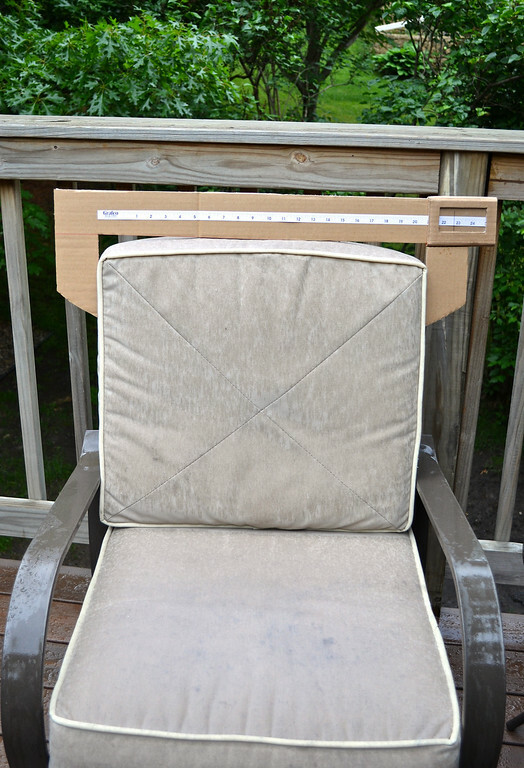 that line will fall on the exact measurement of the thing you're measuring. See? 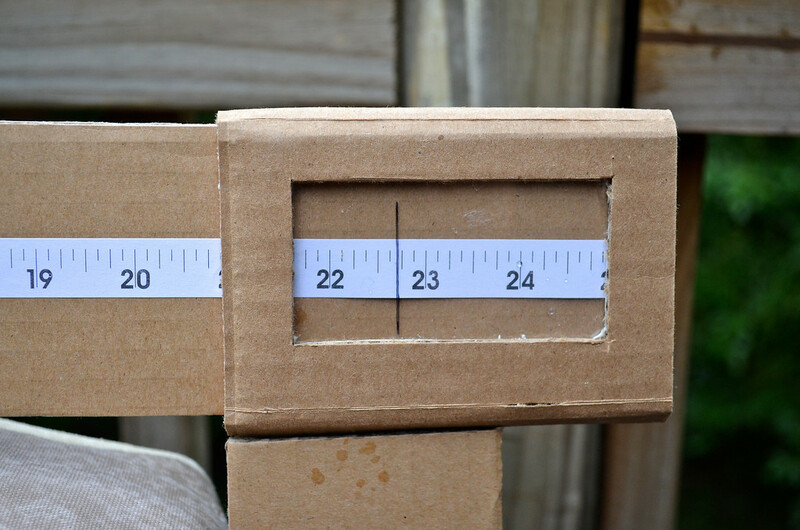 For accuracy, you might want to callibrate it further by measuring a few flat objects with a regular ruler and checking that against your callipers' readings. Of course, were these real Vernier callipers, we could measure to precisions as high as fractions of a millimeter, including random errors of estimation. All very useful in cushion-cover sewing, of course. Snort. Or head-size calculations. I suppose this idea wouldn't take off in clinics for baby head measurements - nothing like a giant clamp over a newborn's face to cheer a hormone-deranged mother up, eh? Anyway, with this tool, I should be able to keep going with that Monster Project. Although after I'd made it last night, I turned on the telly and watched Jurassic Park on DVD, just to get the adrenaline going. The epic soundtrack, the concept of a great idea gone terribly wrong and the feeling of being chased by man-eating dinosaurs does give a person an appropriate sense of urgency. I will not surrender!!!!!! I LOVE your Vernier Calliper! I remember using those in physics class in school also, but yours is way cooler than the tiny ones we had! I must show this to Grandpa... he'll be very impressed! It only makes your Monster Project all the more intriguing!! Keep at it, girl, 'cause you know we're not gonna be able to wait till... say... August!! 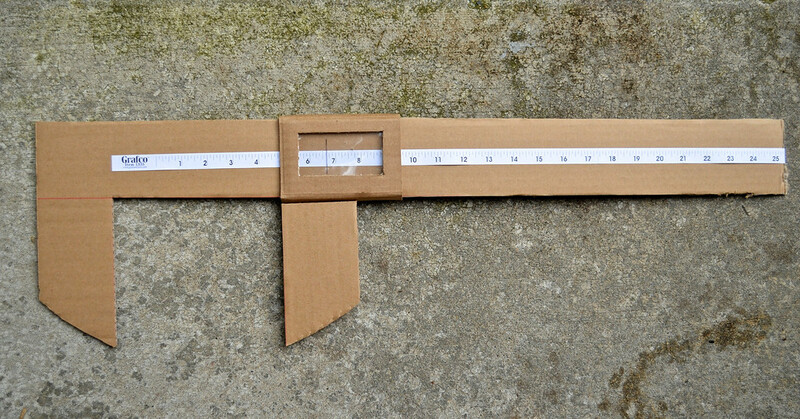 This might be the best thing I've seen in cardboard yet :) Brings back fond memories of my days working in a biomedical engineering lab, measuring test subjects with an anthropometer. I, too, am dying to find out what this project is! Olá, sou do Brasil e paseando pela net achei seu blog e adorei, parabéns por ele. Você já está na minha lista de blogs para que eu possa voltar mais vezes....Bom domingo para você e sua família. 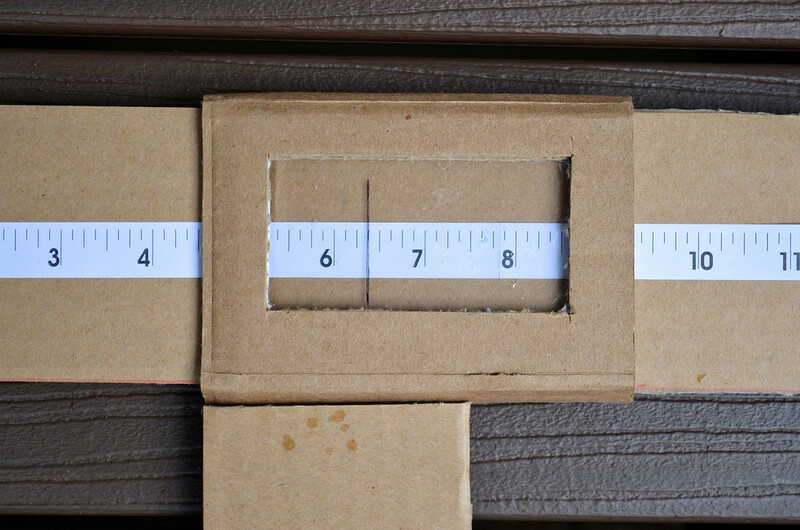 Out of curiosity, Do they have a metric side of the tape in the USA? The ones I use do! One side is in inches, and the other is in cm. Or else I've been looking at the tapes I bought in Singapore. Hm. Now I'll have to go look, since I'm curious, too! Oh do I love the shot of the foot!!! 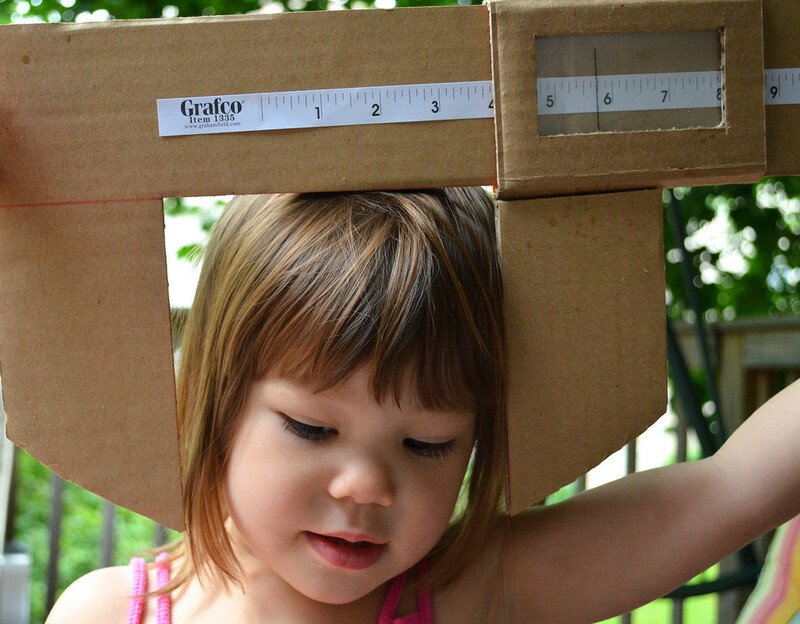 I have been thinking quite a bit about measurement (in metric like anon.) my girls love measuring tapes (it started after they saw Mary Poppins and started measuring everyone), this would be a "practically perfect" addition to that! 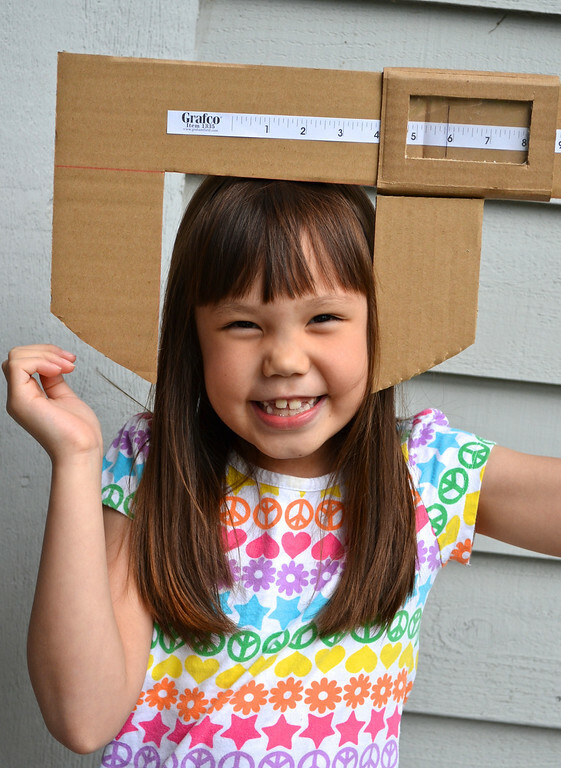 You really mean it when you say you like to make things out of cardboard.